Kerry O'Flaherty will race in Belfast on Saturday after booking her place at the European Cross Country Championship in France on 13 December. Olympic Games-qualified O'Flaherty will defend her Seeley Cup title in Ormeau Park after finishing fourth at Sunday's Irish Cross Country Championships. Men's holder Pollock will not compete in the Belfast race. Pollock has opted to return to his regular training base in London ahead of the European Cross Country tests. The Holywood man was third in the men's race an Santry which represented his first competitive outing since running the Berlin Marathon in September. Pollock went into the Irish European trials as the defending champion but he insisted that he was content with his third place on his return to racing after his Berlin disappointment. The medical doctor achieved the Olympics marathon standard in Berlin but was only the fourth Irishman over the finish line in the German capital which means he will have to race again in the spring if he wants to achieve his Rio ambition. In his regular blog, the latest instalment of which was published earlier this week, Pollock revealed that, after the suggestion of his coach Andy Hobdell, he opted to take several weeks off following his Berlin exertions. "On each of the previous five attempts at the Europeans I have run poorly, having peaked for the Irish trials," said Pollock in his blog. "This year however, I know that, at least, I will be in better shape than what I was at Santry. "With three weeks of hard training ahead of me and the knowledge that my fitness should come back quickly, the nerves are already setting in. "This championship is an unexpected but very welcome bonus. The bigger races will come in the Springtime. "For now however, it is time to focus on the task at hand. The Irish vest is an extremely special thing to wear and come 13 December, I want to run well." While Pollock will not race in Belfast, the Seeley men's race should still be a competitive affair with Letterkenny athlete Danny Mooney and Paddy Hamilton both expected to be in the field. Letterkenny man Mooney represented Northern Ireland at last year's Commonwealth Games in Glasgow and also competed for Ireland at this year's European Indoor Championships in Prague. 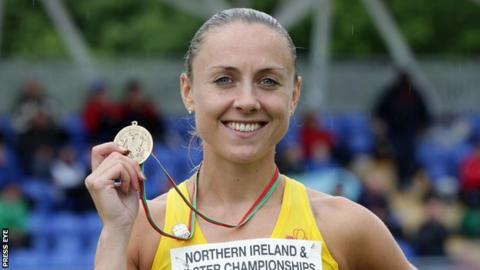 Steeplechase track star O'Flaherty, 34, has opted to compete in Belfast even though she will join Pollock in the Irish team in Hyeres on 13 December. The Newcastle woman, was delighted with her fourth placing at Santry as she picked her way through the field in the closing stages. The Dublin race came immediately after a five-week training sting in French Pyrenees as she continued her build-up towards next summer's Olympics. O'Flaherty may opt to have a short indoor season in February in addition to running in the Armagh Road Races before heading back for another training stint at Font Romeu in mid-April. Commonwealth Games Gladys Ganiel and Kelly Neely will also join O'Flaherty in the Seeley Cup women's field.